Kim Detuzzi is a member of the local community and named the gym after her three daughters. Kim began her gymnastics career at age 8. Kim recently purchased Shoreline gymnastics to make the shoreline gymnastics community a stronger entity. Combined coaches and resources to give the gymnast and coaches more flexibility and stronger teams. Both gyms have merged together to make a stronger family in Niantic! She has coached gymnastics since 1982 and has produced several state, regional and national champions. She was herself a 1st place champion in state and regional competitions in “All Around” events. 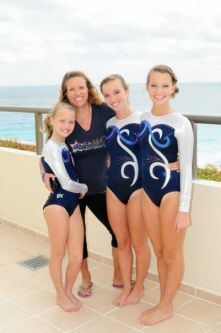 Kim coaches Old Lyme, East Lyme and Waterford High School gymnastics. Kim's 32 years of experience she has motivated her to expand to give the girls in the community a confortable place to work out. Being from Old Lyme one always had to choose which gym to go to now they can now go to both with the same coaches at both gyms depending on the day. Kim has based her life on convince for the customer and wanted everyone to be able to have the best of both worlds. Kim is USA National level JO Compulsory coach, Gymnastics Certified, State Coach Certificated, CPR & First Aid Certified, KATS Certified U100, and High School Certified coach with the CIAC.